In today’s increasingly competitive business environment, trying to keep the customers’ happy and amazed is not easy. 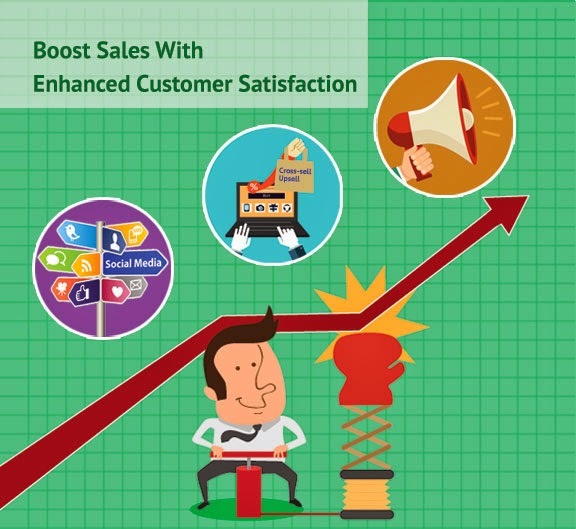 Customer satisfaction has a direct impact on increasing sales and meeting revenue targets! Let’s understand why customer satisfaction and sales is a perfect match in the business environment. Listen to your customers. As an organization, it is important to keep your ears open and constantly take customer feedback. Understand their requirements well, ask them how you can improve, make them feel valued. Once a customer feels that your organization is the best, he will continue doing business with you for a prolonged time. Let us assume that your organization deals with cars. Suppose a customer walks into your store to purchase the latest model. Your sales rep tries to nail it at the very beginning, by being polite and answering all the queries efficiently. Even if he hasn't decided to purchase the car, his first impression about your organization and its people will be positive. It is sure to leave an everlasting impact. Then, your sales rep should follow up, talk about how other customers are really happy with the car, how it has not been problematic to the users, etc. This will eventually, persuade the customer to buy the car. There you go, well-trained and polite sales reps, along with a good CRM solution all you need to persuade your customer to buy. If he has walked into your store with an intention to buy, inquiring about the car, because he really has a need for it, it is up to you and your sales team to maintain a positive relationship with him and finally convince him to buy the car. Cross-sell and up-sell once the customer is happy and convinced. Logically speaking, if your customers are happy with you, would they even consider switching to another organization? Let us assume the same customer who walked into your store purchases the car from you. Now, your sales rep has to be smart enough to pitch for a potential cross sell or up-sell. After a few days of buying the car, why not convince him to buy accessories related to the car. Like; car vacuum cleaners, foot mats, CD/DVD holder, etc. Simply explain how by purchasing these things, his life would be a lot easier or how these items would add to the look and feel of his car. Remember, if he can invest a huge sum in buying the car of his choice, he can definitely purchase other things, if the pitch is made at the right time, in the right manner. Maintain a personal touch through social media platforms. How about polishing and strengthening your relationship with customers by staying connected with them through social media. Ask them for referrals; solve queries on the spot, re-tweet and post positive comments so that others get to know about your organization. Following these 3 simple steps and executing it with CRM for sales will help your organization take business to a whole new level. You can easily step into a new world, where apart from earning enough profits, all your customers’ are not only happy but thoroughly satisfied.